When my neighbor and I see each other in the back yard, we almost always say “hi, there!” Sometimes we yell a question or check in with how each other is doing. And about twice a week, we start a conversation by walking toward our adjoining fence. By the time we reach the fence, we’re halfway through with our discussion, and carry on by assuming our fence-leaning postures. Lisa usually lays her arms over the top, and I usually lean my whole body against the fence and stand on one foot. So, there we stand, three feet apart leaning on the fence and talking…about the topic of the day. Today’s topic was “the proper consistency of jelly products.” Lisa contends that you get what you get, and you eat whatever your fruit decides to offer, “whether it’s jelly, jam, or…jammmlllyy.” In other words, there is a spectrum of what you end up with depending upon the year, the fruit, how ripe or unripe it was, the water content, whether you juiced it in a high-filtered juicer or one that extracts as much pulp as possible, et cetera et cetera et cetera. The point being ~ there’s no real perfection in a recipe unless you’re a manufacturer with specifications, and then that takes the joy out of life. So, how do you deal with crabapples? After all, some years they’re tiny, other years they are fairly good-sized, sometimes they’re a little overripe, and sometimes…well, I could go on but I feel I’ve made my point. Use this recipe. Julie Van Rosendaal took the time to write out the how, why, where, etc. 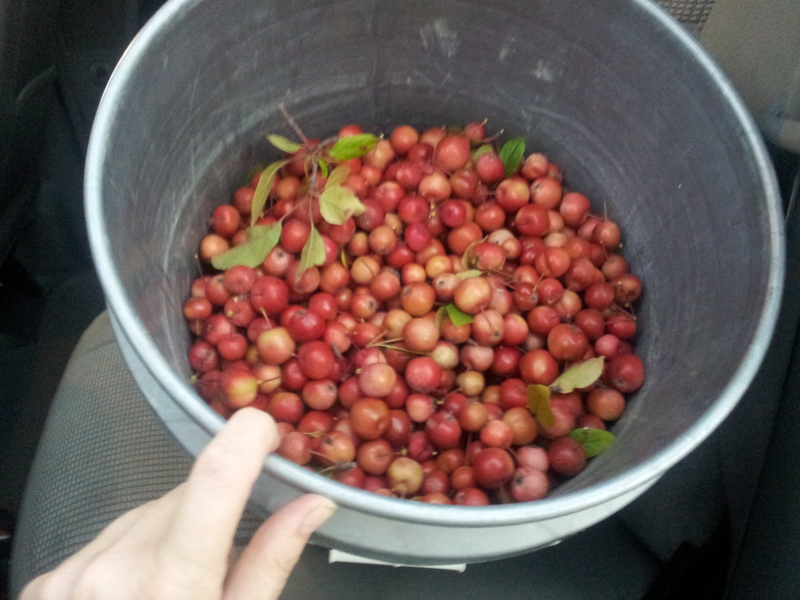 on the proper process of making crabapple jam. There is no reason to keep reading recipes that say x amount of fruit, x amount of water, and x amount of sugar. I agree with her explanations, her sugar ratio, and her explanation about when the jam/jelly/jamly is ready. You’ll be glad you didn’t waste your time reading through 200 hundred mixed reviews of every recipe out there. This one is the best and I stand by my recommendation…and I’m picky. Make sure the fruit is ripe before you pick it. If you rush crabapples, you’ll recreate a mistake I’ve made twice…the fruit will have too much tannin when prepped and it will give your mouth an astringent treatment. If you’ve eaten a green persimmon…same thing. You’ll know the crabapples are ripe and ready to harvest when some of them are already falling off the tree. If you can find one or two that are slightly wrinkled on the tree, this is also a good sign. If the fruit is by and large yellow and slightly wrinkly, you may have missed the window. Taste the apples – they need to be tart, but not astringent in order to work best. You’ll be glad you waited and so will everyone who eats your jam. The only juicer you can really use on crabapples is a fine-straining type. If you want to save some hassle and use straight crabapple juice, I would caution you about this decision. Only if you’ve strained the juice well will it work – seeds, stems and blossoms can also add astringency to juice. My best recommendation is to give up your thoughts about using a juicer and just cook the apples like the recipe says. However, if you INSIST on using a juicer, make sure and understand that there will be a lower pectin rate, you’ll need to strain the juice, and your color might be slightly less because you didn’t cook the whole apples long enough for the peels to stain the juice a nice deep pink color. Take time on the front end to prep your fruit well. The best fruit is washed fruit, destemmed and deleafed fruit, and WORM-FREE fruit. Please be careful and inspect your fruit. If you miss things like I mentioned, they’ll show up in your beautiful jelly or between someone’s teeth. In order to make sure it sets up, it really IS okay to use some SureGel or other type of pectin. 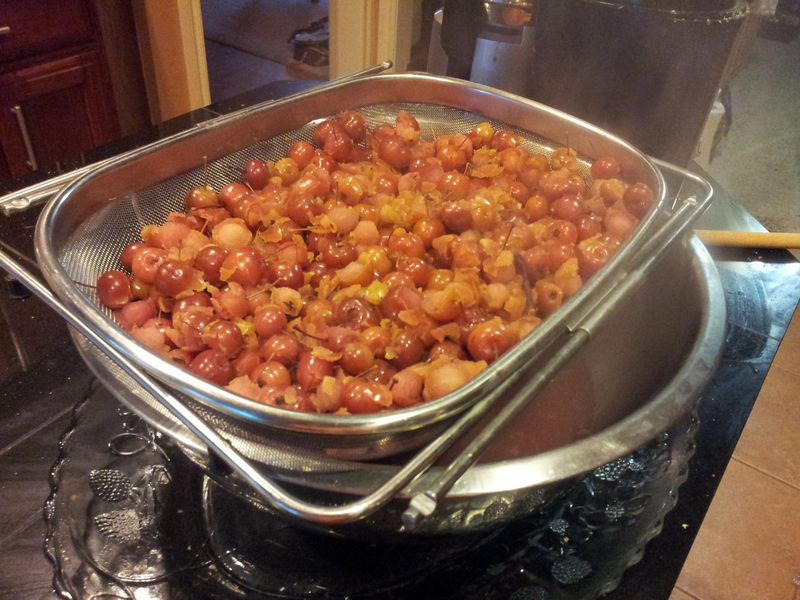 Although the recipe says that crabapples make their own pectin (and they do), I still use about 1/2 box per every 4 cups. Otherwise, you might end up cooking the jamly down for 30, 40 or even more minutes in order to get it to the right setting up stage. Either way, it will be lovely, but if you’re worrying about it setting up – give yourself a break and use SureGel! Can you recook jelly that didn’t set up? ABSOLUTELY. I’ve done this four or five times. Just open all the jars, dump them back into your stock pot, rinse and dry your jars and lids, then recook. Remember the test – – reduce it until it’s clear, pure, beautiful…and test it on a cold plate. The timing should be: already cold plate, add one drop of hot jelly out of your pan, put in freezer for 60 seconds only, take out. If it wrinkles when you push it with your fingernail, it’s ready! If it doesn’t, keep cooking!! Don’t have a crabapple tree? Use the barter system! I have never, ever seen a crabapple tree completely stripped of all the beautiful ripe fruit during picking season. And, I’ve never owned a crabapple tree…I just look for trees in public spaces, or in my neighbor’s yards. If you knock on a door and introduce yourself, pitch this idea: “I’d love to pick a few gallons of your crabapples. May I have permission if I bring you back a jar of jelly?” All they can say is “no.” And generally, they say, “heck yeah!” We’ve utilized trees on golf courses, on university campuses, on street medians and in people’s yards. Keep your eyes open, and let people know you’re looking. There may be trees right around your corner! Okay – that’s it. You can use ANY kind of strainer: a jelly bag, a colander, a strainer like mine (see below), but just make sure you really break apart the apples when you’re cooking them and you wait until all your juice finishes dripping into your pan. 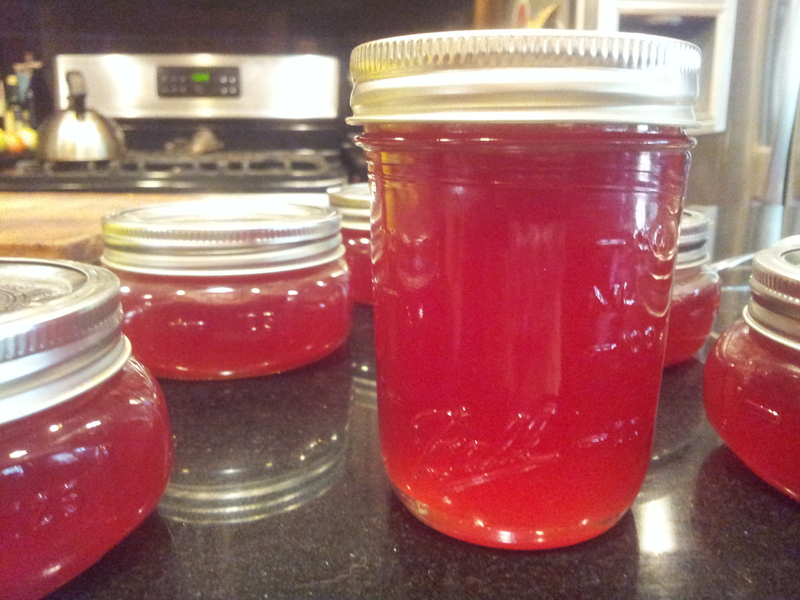 Crabapple jelly/jam/jamly is a beautiful thing. So, take time to honor the beauty and you’ll be richly rewarded with jars upon jars of delicious, precious, jew-ly jamly every time you make it. Very useful discussion of the process of making crab apple jelly. This information is extremely useful for a newbie who needs to have a confident friend who has lots of experience as a jam/jelly maker. Thank you so much. So….no recipe – how do you make the actual jam/jelly?? ?